For many foreign guests to Russia, the national cuisine reveals treasures and curiosities that extend far beyond its best-known delicacies. 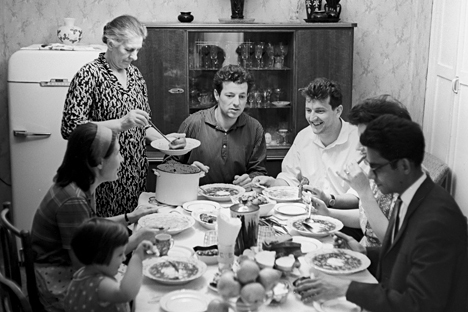 From dumplings and currant juice to raisin bread with mackerel and tea 10 times a day, a survey of writings from travelers from different eras reveal how a gastronomic journey across Russia can inspire anybody. “Classic Russian cuisine is virtually unknown in the United States, apart from vodka and caviar, those enduring ambassadors of goodwill,” Anne Volokh states in the beginning of her famous cookbook, The Art of Russian Cuisine, first published in 1989. Volokh’s solution to this culinary dilemma is to make her recipes as approachable as possible, while also introducing readers to classic dishes that may scare off first-time Russian cooks, such as Herring Under a Fur Coat—a layered salad with herring, beets, potatoes, and carrots. Russians are often shocked by how little Americans know about Russian national cuisine. Americans tend to envision Russian tables covered in borscht, caviar and vodka. And it’s true: when it comes to offering food to visiting foreigners, Russians often return to their roots and reach for some beets to make soup, for the vodka to make a toast. But foreigners who are willing to dive into Russian cupboards, inevitably find a complex set of ingredients for soups, salads, grilled meats and marinated vegetables. More recently American Ian Frazier and British writer Colin Thubron have written books with similar titles (Travels in Siberia (2010) and In Siberia (1999), respectively) that explore post-Soviet Russia from train cars and cross-country road trips, adding to the canon of Russian travel memoirs. Although centuries and decades and shifting government regimes separate these authors’ experiences, their encounters with Russian hospitality and the food offered to them changes little. Frazier, however, had a harder time coming to terms with the “native genius” cooking style. On his cross-country trip, Frazier’s guide made him a lunch of “freshly baked black raisin bread on top of which he put chunks of canned mackerel dripping with oil and garnished with peeled cloves of garlic cut in half...my stomach hesitated. I ate it all, however, and then washed it down with tinny-tasting canned orange juice from Georgia—in retrospect, another mistake.” Frazier, it should be noted, was the only author that included five entries in his index for food poisoning. A region’s cuisine becomes distinct as the population comes to terms with the available resources. When European settlers came to America, they had to learn to cook with maize, a grain that would come to be a cornerstone in their culinary repertoire, especially their liquor. For Russians, ingredients that are now essential to their national cuisine slowly made their way, by force and by trade, into the Russian diet. Smoked fish from the north, tea from the east, buckwheat from the south, potatoes from the west – Russian cuisine is a mirror of the country’s vast geography. Volokh also comments on the extraordinarily large number of fish and mushroom dishes, due to the church’s prohibition of meat for about 250 fasting days per year. These are the outside forces that shape Russian recipes. Another irrefutable fact is this: traveling to Russia will increase your tea consumption by at least 400 percent. Kennan, who spent most of his trip in Kamchatka and was often snowbound, writes: “I managed to pass away the day by drinking tea eight or 10 times simply as an amusement.” Volokh calls this steeped brew Russia’s “national non-alcoholic drink.” In their respective books, Kennan mentions tea-drinking 55 times, Frazier 40 times, Steinbeck 18, and Thubron 14 times. Read more: Mari Vanna offers Russian hospitality in D.C.